You’ve planned all of the details from the church and reception down to the mementos you’ll give to your guests, and now your special day is here. Why not plan the details of what could be one of the most important events of the day….transporting your bridal party and close family members to the wedding and reception! For some people, their wedding might be the only time they treat themselves to a limousine ride, so why not be sure your limo or bus service’s insurance coverage is as good as the appearance of their vehicles? To protect yourself you should ask the limousine or bus company to provide you proof of their insurance limits. You should also ask about background checks and driving records of their drivers. On a day when most celebrations will include partaking in alcoholic beverages, you want to make sure that the people in charge of your safety are fully trained, qualified, safe drivers and are fully insured. Asking for this information could avoid undue risk on your most important day. Don’t think these accidents never happen. They do! When my son was recently married in South Carolina, the limousine was full of guests on the return from the reception to the hotel. As the limo driver turned into the hotel parking lot, he struck another parked vehicle. Fortunately, nobody was injured. What if they were? Think about 25 passengers with potentially competing bodily injury insurance claims. My advice to the bride and groom is be prepared and do your research in advance so you can relax and enjoy your day. Before the wedding, there’re usually the bachelor and bachelorette parties. If you have a large party going out to celebrate your upcoming nuptials, consider renting a limousine and be sure to do the same research regarding limits and types of insurance coverage and driver background checks, so that your family and friends can safely enjoy your evening together. Never drink and drive, or allow your guests to do so. We see the devastating consequences of that conduct all too often. I have found over the years that people don’t realize if you are convicted of driving under the influence of alcohol and cause an accident, the victim injured in that accident can bring a claim against you not only for pain and suffering/compensatory damages, but also for punitive damages. Punitive damages serve three purposes: 1) to punish the wrongdoer, 2) to deter the wrongdoer from engaging in similar conduct in the future, and 3) to deter others from similar conduct. Punitive damage awards can be very significant. So, don’t set yourself up for risk or disappointment on a day you want to be perfect. Protect yourself and your guests. Do your homework. I have been representing injured victims of automobile accidents for many years. It is always devastating when I have to explain there are inadequate insurance coverages for the injuries involved. Certain risks can be avoided. Never allow drinking and driving. 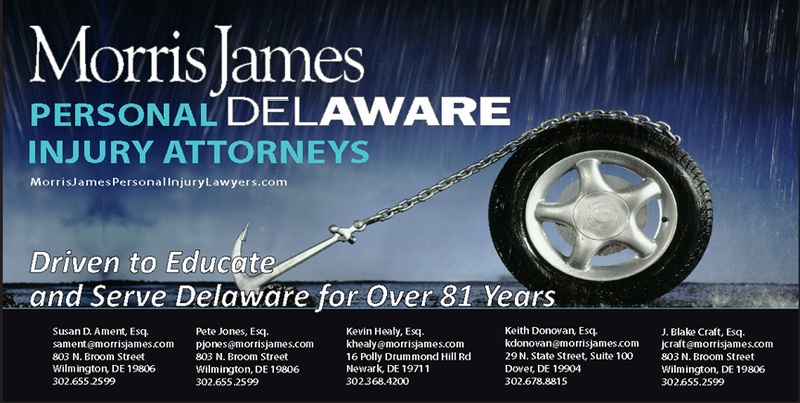 Next Story → Delaware Workers’ Compensation Benefits – Watch your step!